Everywhere we travel, it seems that we are noticing more of something terribly out of place in nature and on man-made structures: people are “tagging” with graffiti. 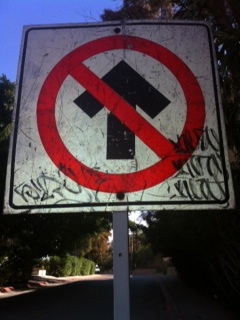 The graffiti shows up in many forms such as names, dates, political or religious statements, drawings, profanity or expressions of love, just to name a few. I suppose that leaving a mark is in our nature as human beings. From the earliest cultures, we have found evidence of their stories and people left signs of their presence. These marks are part of our history and date back hundreds and thousands of years. The world is a different place now and it would be a much more beautiful world if members of society would chose to protect places of beauty and find an alternative way to leave their mark. 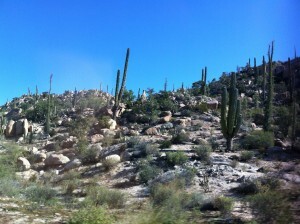 One of the most beautiful and amazing places we see on our trip up and down the Baja is the Cataviña Boulder Field. The Field runs for miles and miles and the hills and valleys are filled with tens of thousands of magnificent, building-sized boulders, gigantic rock formations and amazing cacti. This area, known as Baja’s rock garden, has unfortunately been “tagged” by people who feel they need to leave their mark. On our way to California last year, we were delighted to see that someone attempted to cover the graffiti with beige paint to match the color of the boulders. By this year, however, many of the rocks were again “tagged”, but fewer than in years past. This entire region is under the protection of the Parque Natural del Desierto Central de Baja California, so perhaps they have been the party responsible for covering the defacement, or perhaps there are some dedicated good Samaritans who have taken that responsibility onto themselves. Whoever it is, we’re grateful. There is a little white house across and down the street from us that we pass every time we drive to our home. 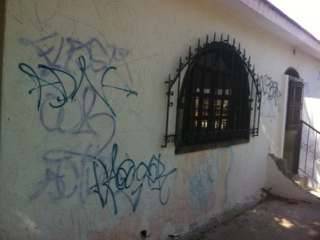 Because the property is deserted, it is constantly defaced with graffiti. Every year, we purchase white paint and try to send a message that the “tagging” won’t be tolerated by painting over the graffiti with fresh white paint. My fear is that the “artists” just see us providing a new, blank canvas every time we do that. Oh well, perhaps more people will get the message. I find it very sad that “tagging” has become such an accepted way for people to leave a mark. Make memories with photos when you’re travelling through places like Cataviña instead of defacing the boulders, write an editorial if you need to make a political statement, write a book, mentor someone, leave a legacy and just live your life as you’d like to be remembered and eulogized – that’s a much better way for each of us to leave evidence that we existed. Tagged alternative, amazing, artists, Baja, Baja California, beautiful, beauty, beuatiful, Boulder Field, boulders, building-sized, cacti, California, canvas, Cataviña, cultures, dates, defaced, defacement, deserted, drawings, editorial, eulogized, evidence, existed, expressions, Field, formations, forms, gigantic, graffiti, grateful, hills, history, home, human beings, hundreds, legacy, live your life, love, magnificent, man-made, mark, marks, members, memories, mentor, message, miles, names, nature, paint, people, photos, place, places, political, presence, profanity, property, protect, protection, region, religious, remembered, responsibility, responsible, rock, rock garden, Samaritans, society, statement, statements, stories, street, structure, tagging, thousands, travel, travelling, valleys, white, White House, world, write, write a book, year, years. 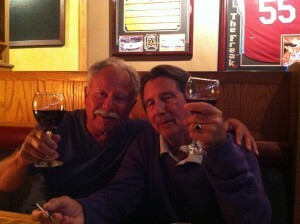 Ron and Mike have been dear friends for over fifty years. They met at the grocery store in Santa Clara that they were both working at while in high school and college. They share a rich and wonderful history together and have seen each other through much of life’s journey. Ron and Mike basically see one another twice per year: on our way north and east to New York in May and then again on our way west and south in October. They rarely contact one another in between, but pick up exactly where they left off when they do see one another. As with all of Ron’s friends and family, Mike has made me so welcome and I love hearing the stories of their shared past. We spend as much time as possible with Mike when we’re in Santa Clara: tennis, billiards, dinners at their favorite sports haunt, By-Th-Bucket Bar and Grill (www.btbbarandgrill.com) as we usually arrive in Santa Clara in time for the World Series finals, and shared meals at Ron’s Mom’s house. Mother Mary has adopted Mike as practically one of her own and Mike, as a bachelor, thoroughly appreciates her fabulous home cooking. We spent Halloween night with Mike and his lovely new girlfriend, Debby. We met them in Los Gatos and had a great time walking down Main Street and Santa Cruz Avenue checking out the costumes. Both Mike and Debby were in costume, but Ron and I were disguised as tourists yet again! We ended up dancing and sharing some drinks and more than a few laughs at Number One Broadway, the Los Gatos place for live music (www.numberonebroadway.com). It was a great evening and we always enjoy spending time and sharing life with Mike – one of Ron’s oldest and dearest friends. Tagged bachelor, billiards, By-Th-Bucket, college, costumes, dancing, Debby, dinners, drinks, east, family, friends, grocery store, Halloween, high school, history, home cooking, laughs, life's journey, live music, Los Gatos, Main Street, May, meals, Mike, New York, north, northern California, Number One Broadway, October, past, Santa Clara, Santa Cruz Avenue, south, sports, tennis, tourists, Welcome, west, World Series. 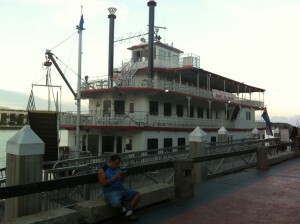 We drove through western Louisiana to see our friends, Stretch and Mary, in Lufkin, Texas. Neither of us had been in eastern Texas before and we were pleasantly surprised to see how heavily treed and beautiful this area is. Stretch and Mary acquired land and a trailer park that they have worked relentlessly on over the past eight years and have created a high-end and high-quality home for themselves and for all the other people who live there. 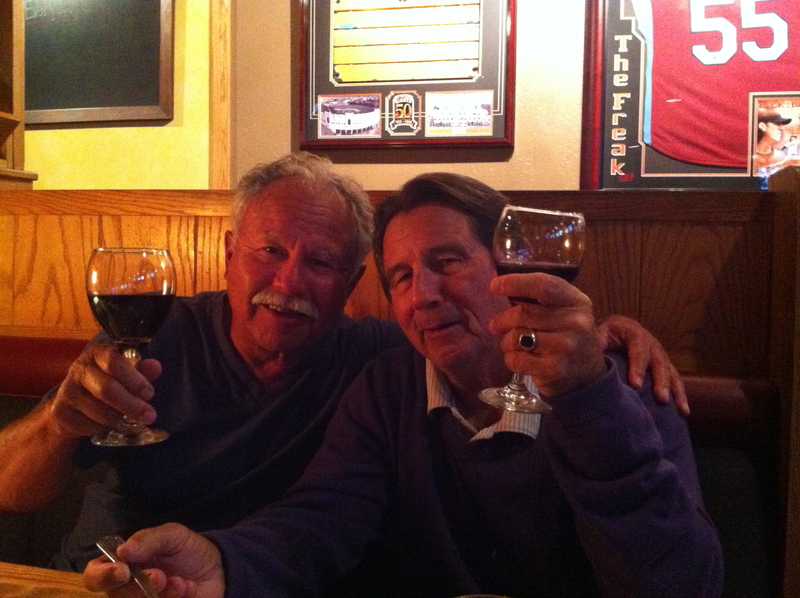 Ron and Stretch have been dear friends for some thirty-odd years and have a ton of shared history and memories together. Ron adores Stretch and Mary and they mirror the same feelings of love and respect for him. As the newcomer to the foursome, they couldn’t be more gracious or make me any more welcome. I love hearing the stories of their past and of the memories they share. We enjoyed great conversation, lots of laughs and talked until the wee hours of the morning. The Walmart in Lufkin will never be the same (who knew it was a tourist destination or that we might be considered “WalMartians”? ), and our trip there resulted in the discovery of Blue Bell Pumpkin Spice Ice Cream and several other fabulous flavors! We had such a splendid visit with Stretch and Mary and didn’t want it to end, but we needed to get back on the road. While we were there, Stretch had made an appointment for us to get the brakes fixed on the BMW and, after two nights and our car repaired and ready, it was time to go. 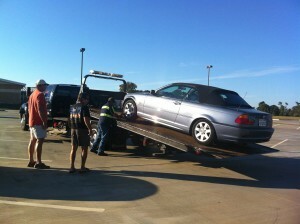 We set off and got about thirty miles from Lufkin when a terrible sound started on the right rear wheel. Stretch came to the rescue, took a look and he and Ron determined we needed to get the car back to the mechanic to properly remedy. Our second trip to Lufkin in three days was on the back of an AAA tow truck. The return was not planned, of course, but allowed us ensure the car was safe to drive, to spend one more night with our dear friends, and to partake of Mary’s famous and delicious Manhattan style clam chowder. It really was time to leave the next morning, and with a cup of Stretch’s great coffee to prime us, we set off once again. We had a wonderful time and look forward to making Stretch and Mary as welcome at our home in Cabo in a few months’ time. Tagged AAA, Blue Bell ice cream, BMW, brakes, Cabo, clam chowder, coffee, conversation, friends, history, Louisiana, Lufkin, Manhattan, Mary, memories, Pumpkin Spice, Stretch, Texas, tow truck, Walmart, Walmartians. 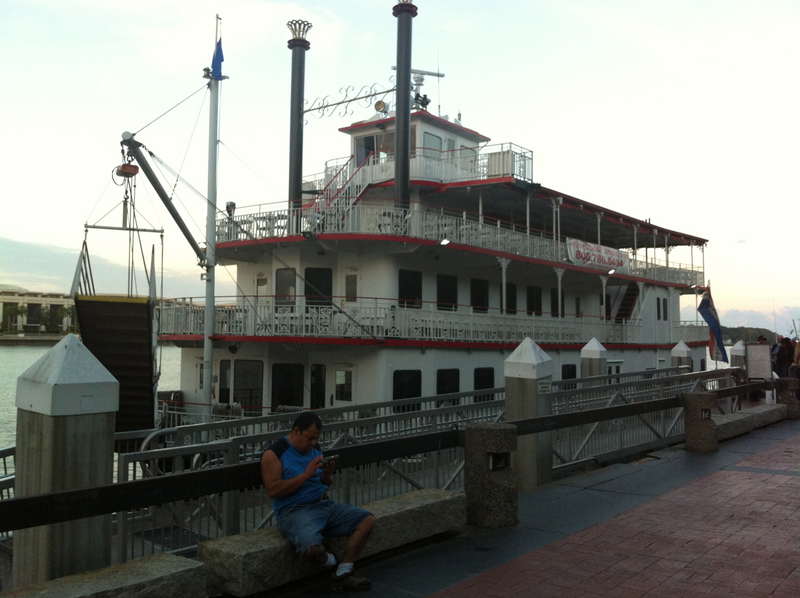 We arrived in Savannah, GA in late afternoon and parked near the waterfront as that appeared to be where the action was. There’s a lot of history in the south, most of it good and, unfortunately, some of it bad, but it’s important to take in as much as we can to understand the past. 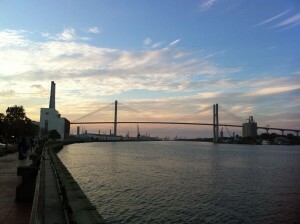 It’s hard to imagine the ships bringing slaves to the harbors of this beautiful city and the horrid treatment of people. 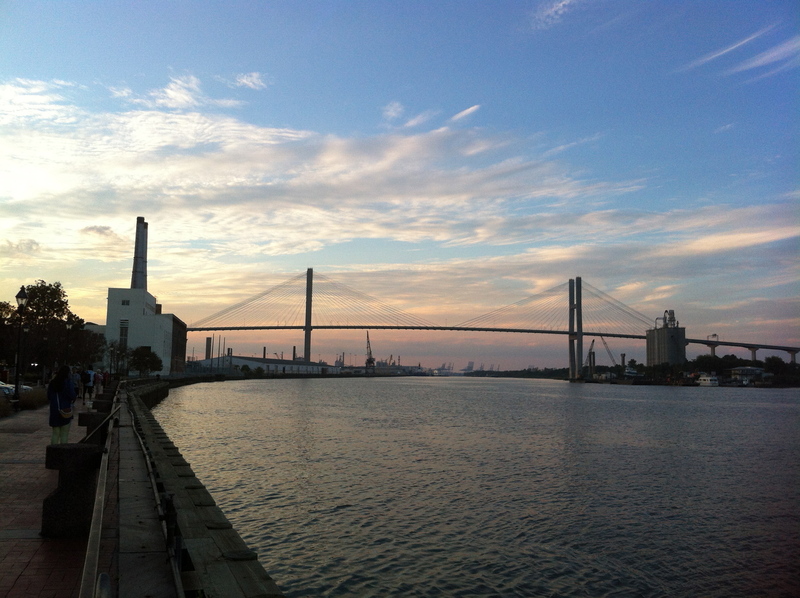 We watched the sun set over the harbor and took a stroll down the historic marina area. We were feeling like listening to some live jazz, and were referred (by a lovely young woman in a gorgeous B&B we’d love to stay at on our next visit – see www.oldeharbourinn.com) to a nearby restaurant called Jazz’d (jazzdtapasbar.com) that serves tapas – perfect! We shared some fabulous dishes: She Crab Stew (a Savannah favorite cream based stew with chunks of blue crab and vegetables), Sauteed Mushroom Ratatouille, Fish Tacos “A La Plancha” and Chorizo Sliders with a glass of California pinot noir. A two-piece blues band called Bottles and Cans (Ray Lundy and Mike Walker) were playing and we thoroughly enjoyed them, despite that we were hoping to hear some jazz that night. Both musicians play guitar, but Ray’s voice is really unique; raspy and whisky-soaked. The couple sitting at the adjacent table from Charlotte, North Carolina, Hillier and Yvonne, bought us a glass of wine to welcome us to the south and, before the end of the evening, we were able to buy them a glass of port to thank them and put a smooth finish to our conversation and evening. Hillier and Yvonne have only been seeing one another a few months and I think they would be close to our ages. Hillier commented that he couldn’t imagine travelling like we have and felt that, as a man of color, that it wouldn’t be possible. We struggled to understand his viewpoint, but respect that he has a right to that belief. Only he has walked in his shoes and lived in his skin. We thoroughly enjoyed meeting them and sharing some fine music and conversation and were grateful to have met them. Tagged blue crab, blues, Bottles and Cans, California, Charlotte, chorizo, fish tacos, Georgia, guitar, harbor, history, jazz, Jazz'd, Mike Walker, mushroom, pinot noir, port, Randy Lundy, ratatouille, Savannah, She Crab Stew, ships, slaves, sliders, south, tapas, waterfront.